Ladies and Gentlemen! Moms and Dads! Be prepared to be amazed, as I reach through this screen and magically read your mind! I’m sensing that you are feeling a tad uncomfortable with the standard baby formula brands but are also concerned that goat milk formula may be a wee bit hippie dippie for you. I get it. After all, anything you’re putting into your child’s body should be seriously vetted. So, let me share some of the research I’ve done over the years about the goat milk vs cow milk difference and offer some results. They are more different than you think. Aaaannnd in this corner we have the Buffed-Up Bovine all hyped up and ready for some sibling rivalry against Billy the Kid in the battle (bottle?) for baby formula supremacy! Like breastmilk, all baby formulas are based on finding the perfect balance between three macronutrients – protein, carbohydrate, and fat. It’s the formula (see what I did there?) for mixing those macronutrients that separates each brand. Each formula company has their own recipe. Companies may choose from a range of carbohydrates and fats for their formula recipe, but it’s the protein source that really sets goat and cow milk formula apart. Breastmilk contains a gentle combination of whey and casein proteins, in a ratio of 60:40 (that’s 60% whey, 40% casein proteins). Whey proteins are naturally easier to digest and stay liquid during digestion. Whereas casein proteins curdle during digestion and take longer to break down. Curd quality is really the defining difference when it comes to goat milk vs cow milk: goat milk produces small curds that are easily digested, while cow milk leads to harder curds that break down more slowly. If you were to give your baby a glass of cow milk or goat milk, the natural balance to that would be 20% whey and 80% casein. Adding whey protein adjusts the protein ratio and makes baby formula easier on tiny tummies. Not every formula (cow or goat) will add whey protein – it’s something you need to check on your ingredient label. Kabrita (who produce goat milk formula) does add goat whey protein to their goat milk, making their product even gentler. You don’t want to give your baby goat milk (on its own). You want to give your little one a special solution based on goat milk. Goat milk (on its own) may contain too much protein for newborn kidneys – it’s hard for them to handle the by-products of goat milk protein breakdown. This is why choosing a formula based on goat milk, where the protein has been safely adapted (decreased) become super important! It is essential that your baby gets carbohydrates. These are easily burned as a quick fuel for your growing child and help with digestion. Many formulas based on cow’s milk will add corn syrup or brown rice syrup, but breastmilk uses lactose as their main carbohydrate so Kabrita follows suit. The only carbohydrates used in their goat milk formula is lactose. The result is a taste that is naturally sweet, just like breastmilk! Fatty acids are absolutely essential in good health. A whopping 25% of breastmilk is made up a fatty acid called palmitic acid. Most of the fats in breast milk come in a triglyceride – that’s just a fancy way of saying ‘trio of fats’, and in the case of palmitic acid, it’s most often that middle tine of the fork! Most formulas deliver fatty acids using plant-based oils. What’s interesting is that even though they offer palmitic acid (among many other important fats) their palmitic acid often ends up on the outside of the fork (or hotdog bun! ), with another oil in middle (like a hot dog). The issue is that some babies can struggle to digest those oils and oil structure, and it can lead to constipation and gas. Kabrita’s goat milk formula turns that inside out, using a special fat blend and nestling the palmitic acid on the inside of the trio, and putting oleic acid molecules on either side (like you find in breast milk). The result is fatty acids that slide through the cell walls much easier, letting them be simply absorbed instead of clogging up the intestines as rejects. Other than the actual design of goat milk formula vs cow milk formula, there are two other major factors that have really turned my head and transformed me into a believer. When the casein protein hits your baby’s tummy, the digestive acids inside will instantly start trying to breakdown that protein into smaller pieces that your baby’s body can correctly absorb. The moment it hits the stomach, the milk will start to curdle. Formulas based on cow’s milk tend to curdle into hard, dense balls of protein. The denser the ball, the harder it is for those digestive enzymes to get in there and start breaking it up. The result is constipation! If your baby struggles with digestion, one of the best things you can do for your child is to switch to a formula based on goat’s milk instead. The curd formed from goat’s milk proteins is light and airy, like a whiffle ball, with lots of space for those digestive enzymes to get in there and do their job. Another unexpectedly awesome thing about goat milk formula is that it has been shown to help children with eczema patches of dry skin. Although goat milk formula is not a good substitute for children who have been diagnosed with a milk allergy, it may be an extremely helpful tool in helping kids who have a sensitivity to cow’s milk, the type that often shows up in itchy red patches on the backs of elbows and knees. The only company that manufactures goat milk formula that is readily available in the US is Kabrita, made by Ausnutria, a Dutch company with over 100 years of dairy and nutrition expertise. They source their goat milk from a co-op of 55 family farms. All of the ingredients used in their formula, including the goat milk, independently meets European Union requirements to contain less than 0.9% GMO ingredients. Over the past several years, I’ve enjoyed getting to know the eight ladies that make up the KabritaUSA team. These aren’t a bunch of stuffy old men who haven’t held a baby in forty years. 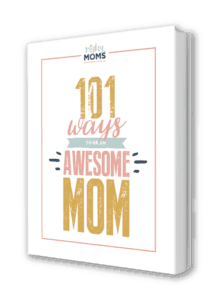 Most of them are moms, just like you and me, who strongly believe in the health benefits their goat milk formula, and have a burning passion to tell more moms about it. Right now, Kabrita’s goat milk formula is only recommended for babies and toddlers over 6 months old who are also eating solid foods. If your child is not quite there, go ahead and pick up a tin and let it sit on your shelf until the right time arrives. One: Mix 20% goat milk formula with 80% breastmilk, or your regular formula. Two: Mix 50% goat milk formula and 50% breastmilk or your regular formula. Three: Mix 80% goat milk formula with 20% breastmilk or your regular formula. Four: 100% goat milk formula! This is a nice and slow way to help your child’s tummy get used to the adjustment in proteins and carbs as you switch from the cow milk formula family to the goat milk formula family. It’s amazing what a huge different a simple formula shift can have on your baby’s overall health and happiness. Of course, I wouldn’t just assume you’d take my word for it! Read the switching stories of other moms, just like you, and how goat milk formula made a huge impact on their child’s wellbeing. Not Just for Granola Moms! See? Goat milk formula isn’t just for hippie crunchy moms! It’s for the mom struggling with a fussy gassy baby. It’s for the child with boulders in his diaper. Goat milk formula is for those itchy red bumps leaving your child swollen and scratchy. It’s for the mom who feels uneasy about the standard cow milk formula, stressed about the warnings about soy formula, and just wants something that will provide good nutrition without the extra side effects. If that’s you, this is what you’re looking for.